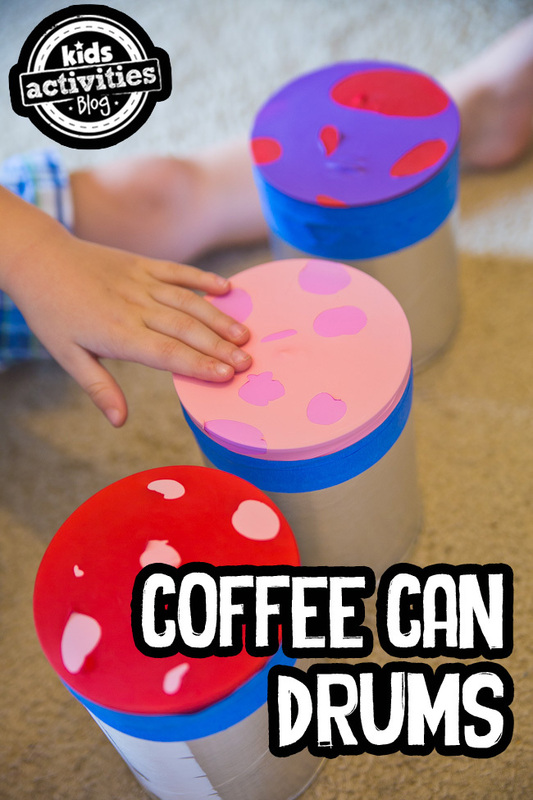 Let kids create some music of their own with some simple Coffee Can Drums. This fun activity inspires creativity not only in the creation of the instrument, but in the hours they’ll spend banging on the drums after! The best part is that they’re super-easy to make! All you need to create your own coffee can drums are some old coffee cans, balloons, scissors, and some packing tape. Cut the nozzle off the balloons and stretch them around the can. We double layered the balloons for durability and cut the top layer for a fun effect. 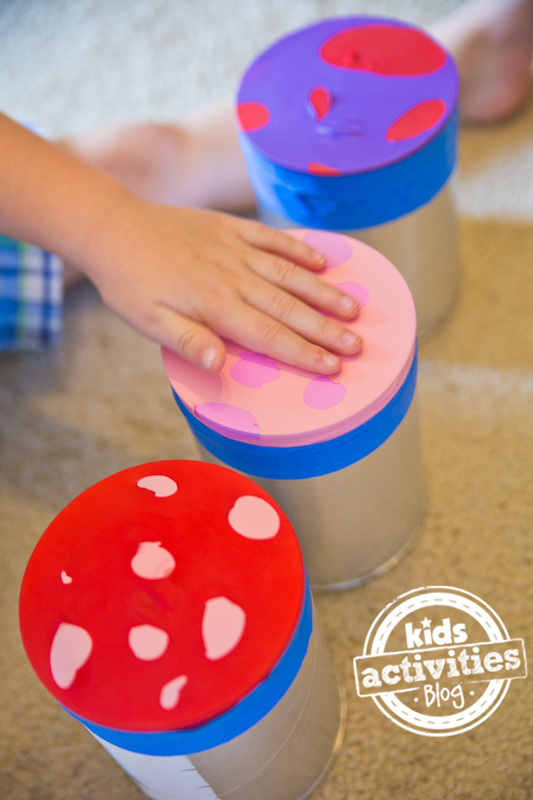 Tape them in place, and your kids are ready to make music! I remember hours, days, spent as a kid and teenager at a local non-profit artsy place  called Mars Hill. It was there that I first started playing the guitar, they let me make a mess as I created some of my first mixed media sculptures, had fun making the sounds of rain  in a drum circle, learned how to spray-paint (my re-made furniture is thankful), and participated in poetry contests. It was free and it was fun! I learned to appreciate and look for the unusual and different in the world around me. Previous Post: « This toddler tries to reprimand her mom, and it’s adorable! those are SO funky! love them! I love the affects of the balloons. We are just going to have to try some of these ourselves. Oooh I like the “two tone” idea of your drums! And they look fabulous! We will definitely be making some… Red Ted would adore them! Thank you again for linking up to Kids Get Crafty! love this project, especially now that i understand they are drums! Still think it’s awesome! 😉 Thanks for adding this post in last week’s High paw! Hope to see you participate this week too! 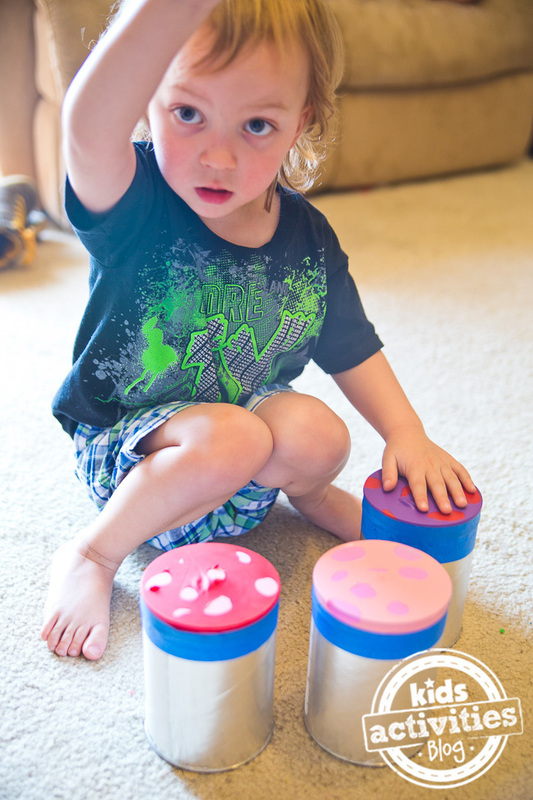 Love your idea of creating drum using balloons, scissors and some packing tape. Keep it up! I love this idea. How do the drums sound? I’ll be doing this idea with my 4 year olds. Thanks! i love it..please do send to me the steps. thanks! It’s genuinely very complex in this busy life to listen news on TV, therefore I only use web for that reason, and get the latest information. might as well check things out. I like what I see so now i’m following you. Look forward to looking over your web page for a second time.